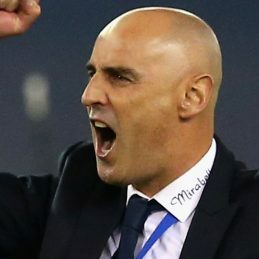 The current coach of Melbourne Victory, the former Rangers, Wolverhampton Wanderers and Millwall player, Kevin Muscat is one of the most popular figures in Australian Soccer. The announcement of his signing to Melbourne Victory in the newly formed A-League attracted more media attention in Melbourne than the announcement of the league itself. Kevin’s illustrious career has seen him captain virtually every team he has played for including the Socceroo’s at every age level. His coolness under pressure was never more exemplified with his late penalty winner against Uruguay in the first leg of the World Cup qualifying play-off. His reputation as a tough defender is echoed from strikers the length and breadth of Britain. It was yet another honour for Kevin to be given the captaincy of Melbourne Victory in their inaugural season and to cap it all off he was awarded the “Most Valuable Player” as voted by his peers. There are many highlights in Kevin’s career that will continue to be noted but to have played 50 times for his country and score 10 goals including four in one game as well as stunning victories against England, France and the current World Cup holders Brazil would surely go down as his most memorable. Looking to the future, Kevin is forging a media career with a regular weekly column in the Melbourne Age as well as continual guest appearances on Fox Sports Football and SBS. His unique and insightful knowledge of the World Game have made him a popular choice on television and radio.